"Freeborn is a Firm which enables me to work with my clients to do precisely what is in their best interests. This means that I take the time necessary to listen to my clients’ needs and formulate a strategy to solve their problems efficiently, creatively and effectively." 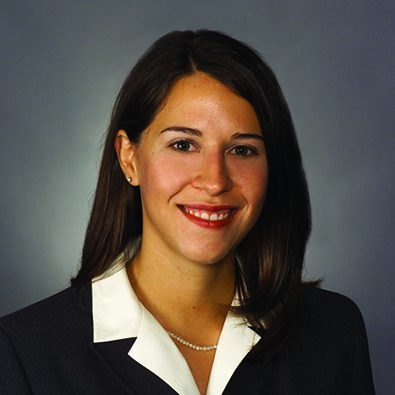 Gia Colunga is a Partner in the Litigation Practice Group and a member of the Complex Litigation Team. Gia represents clients in all phases of complex litigation in state and federal courts across the country. Her experience includes a wide range of commercial cases, including litigation relating to breach of contract, franchising, aviation, products liability, sexual abuse, fraud, trade secrets, restrictive covenants and other employment matters, such as retaliatory discharge, Title VII, ADEA and FLSA disputes. But Gia's "sweet spot," so to speak, is managing sensitive litigation, which may have a difficult subject matter like harassment or sexual abuse, be worth millions of dollars, or have hit the news. In those types of cases, her skills truly shine through. Indeed, during one such case, Gia received the "40 Under Forty" award from the Chicago Daily Law Bulletin and Chicago Lawyer. One of her nominators for the award said: "without a doubt, that of the more than a dozen skilled lawyers involved in this case, Gia has the best, most comprehensive grasp of the facts of the case, the nuances of the witnesses and the legal principles applicable to the litigation." The nominator continued, saying, "she is one of the select few who has the natural talent, the drive and the quintessential professionalism to lead the bar in the years ahead." In addition to her general caseload, Gia regularly devotes time to non-profit organizations and to pro bono matters. In fact, the Illinois Legal Aid Online non-profit organization recognized her for pro bono work, naming her the pro bono attorney of the month. Gia is also on the Board of Directors for Girls on the Run Chicago, a non-profit organization dedicated to preparing girls for a lifetime of self-respect and health. Defended large church in a variety of matters, including sexual abuse and harassment. Served as lead counsel for a large corporation in a multiple plaintiff, multiple defendant child sexual abuse case. Secured a victory after a four-day bench trial in federal court in a restrictive covenant case brought by a large national insurance brokerage client against a former executive, with the Court, among other things, awarding $1.9 million in attorneys' fees, imposing a permanent injunction, and referring the defendant to the Office of the United States Attorney for investigation into possible perjury charges. Defeated breach of contract and federal claims asserted against an airline. Represented various manufacturers in products liability cases across the country. Federal Regulations Update, Empl. Rel. Today, 42(3): 51-57 (Fall 2015) (co-authored with Rachel Atterberry). Federal Regulations Update, Empl. Rel. Today 42:49-54 (Spring 2015) (co-authored with Rachel Atterberry). Federal Regulations Update, Empl. Rel. Today 41:53-5 (Fall 2014) (co-authored with Rachel Atterberry). Author, "Supreme Court to Decide if Security Screening Time is Compensable Under FLSA,” 29 No. 7 WJEMP 1, Westlaw Journal Employment (October 2014). Author, "Center Partners, Ltd. v. Growth Head GP, LLC: The Subject Matter Waiver Doctrine Does Not Apply To The Disclosure Of Privileged Documents During Business Negotiations." Illinois Institute for Continuing Legal Education Civil Litigation Flash Points Series (March 2013). Co-author, "Trial Techniques in Business and Commercial Cases," Business and Commercial Litigation IICLE (2012). Author, "Greer v. Advanced Equities, Inc.: Confirming That a Nonrelease Clause Precludes Fraud as a Matter of Law," Illinois Institute for Continuing Legal Education Civil Litigation Flash Points Series (April 2012). Author, "Palmolive Tower Condominiums, LLC v. Simon: Clarifying When An Appellate Court Has Jurisdiction Over An Appeal Pursuant To Illinois Supreme Court Rule 304," Illinois Institute for Continuing Legal Education Civil Litigation Flash Points Series (June 2011). Author, "Steam Sales Corp. v. Summers: The Validity of the Legitimate Business-Interest Test is a Continuing Debate," Non-Competition and Trade Secret Advisor (4th Quarter 2010). Author, Nationwide Business? A Non-Compete Agreement with a Customer Restriction Can Protect Your Bottom Line, Non-Competition and Trade Secret Advisor (Spring 2010). Author, "People v. Givens: Examining the Court’s Ability to Address Issues Sua Sponte," Illinois Institute for Continuing Legal Education Civil Litigation Flash Points Series (July 2010). Author, "Turner v. Memorial Medical Center: Emphasizing The Challenges A Plaintiff Faces When Alleging A Retaliatory Discharge Claim," Illinois Institute for Continuing Legal Education Civil Litigation Flash Points Series (August 2009). Author, "Imperial Apparel, Ltd. v. Cosmo's Designer Direct, Inc., Reexamining The First Amendment's Effects on Defamation," Illinois Institute for Continuing Legal Education Civil Litigation Flash Points Series (April 2008). Author, "Home-Buyers Beware: Your Title Insurance Protects You Only So Far," Illinois Institute for Continuing Legal Education Civil Litigation Flash Points Series (June 2006). Rachel Atterberry and Gia Colunga authored the "Federal Relations Update" article from the fall 2015 issue of Employment Relations Today.